William was Alexander Bowie and Margaret Hill's eldest son and his lefe story is one of Tragedy. Academically bright William went to both The University of Glasgow and the University of Edinburgh and graduated as a surgeon at the age of nineteen. He proceeded to his first job in Portpatrick and came home to Strling eight months later to die of what appears to have been tuberculosis. This amazing story is recounted by quoting the actual letters between Alexander Bowie and William during his stay in Portpatrick. This amazing archive of material was taken by Helen to New Zealand, subsequently transferred to Australia and finally taken to Canada by one of Helen's daughters. Their descendants, at present in Toronto, have made this material available to me. For this I am extremely grateful. I trust that, as far as possible, you enjoy the sad tale. I have not shortened it at all as I wish the full archive to be available. After Helen the greatest amount of archived material exists about William, who was Alexander and Margaret Bowie's eldest child, and, for that reason plus the fact that it gives a fullar insight to the character of Alexander Bowie himself a separate chapter has been devoted to him . The central themes that dominated most of his short life must surely be 'education and work'. Topics that stretch from the local burgh school in Stirling through both the Universities of Glasgow and Edinburgh to Portpatrick in Kircudbright. EDUCATION IN SCOTLAND The claim that education has always been important in Scotland is well founded and, from earliest times, Stirling had a history of having an extensive local system of schooling. Reflecting the power of the Church the first schools were probably the pre-reformation schools dating from around the middle of the twelfth century and attached to the monasteries. After the Reformation, however, the power of the Church diminished and the power of the local Town Council increased. STIRLING SCHOOLS A highly detailed and scholarly history of the the involvement of Councils and the Church in education together with the Scottish Grammar School system in general and the Stirling Grammar School in particular is to be found in 'The History of the High School of Stirling' published in 1904 by Eneas Mackay, Stirling. by A.F. Hutchison Rector (from 1866--1896) of the High School of Stirling a later development (1854) of Stirlng Grammar School. In the time of William Bowie there were a number of schools in the Burgh. Apart from the Grammar School the two main ones were designated 'The English School', (1740--1856), and the 'Writing and Mathematical School', (1747--1856). As no detailed records of these schools remain we cannot know with any certainty which one the young William Bowie attended. However from one of the letters to William from Alexander Bowie where he says that Alexander has just started with Dr Monro, the teacher at the Grammar School we could readily suppose that William also attended there. From a comment in a letter that survives from one James Mitchell, Glasgow, addressed to Mr William Bowie, Student, Stirling, care of Mr Alex. Bowie, Builder, Stirling dated 1820, (when William was eleven and a half years old), we can deduce that 'could have tried harder' may well have graced a report card from these early years. "I was very much gratified with your sentiments and above all with the modesty with which they were expressed. I was happy to hear that you were pursuing your studies with greater vigour than formerly. I hope you will persevere in this course." WILLIAM'S UNIVERSITY EDUCATION To our modern eyes the strangeness of the Scottish Higher Education system of the time can be seen from the information about William that, happily, has survived in the form of class tickets issued as proof of attendance and payment at University courses. In 1822, at the age of fourteen years, he matriculated at the University of Glasgow and class tickets tell us that, from the 22nd of October that year to the 18th April 1823 he took the Junior Greek Class by D.K. Sandford L.G.P. From the 4th November 1823 to 1st May 1824 he took George Jardine's Logic Class and from November 1823 to May 1824 he studied in the Senior Greek Class of D.K. Stanford. Attending University at such a young age was quite common at that time, Thomas Carlyle, for example, went to Edinburgh University at age 12--13. James Crichton 1560--1585, the 'Admirable Crichton' attended St. Andrews University from age ten. Clearly, from the subjects that he studied at Glasgow, William was using Glasgow University to study at a preparatory rather than degree standard. Presumably this was necessary because the teaching in the Burgh Schools did not reach a high enough standard. Williams main, career oriented, university study came when he moved to the University of Edinburgh when, from 27th October 1824 at age 16 years, he took a class in Chemistry and Pharmacy under Thomas Charles Hope M.D.& P and attended classes in Anatomy and Surgery given by John Barclay M.D. The teaching at Edinburgh Medical School had been dominated by one family for three generations Professor Alexander Monro tertius, his father and Grandfather before him, held the chair of anatomy and under him the study of anatomy was considered, by many, to be in a decline. Around this formal University, structure there was a system of 'private lectures' or 'extra mural studies' as they came to be called. In 1825 William matriculated at the University of Edinburgh and began studying medicine. That year he took Materia Medica and Clinical Surgery plus an external class in Anatomy and Surgery, according to the class ticket jointly with John Barclay M.D. and Robert Knox M.D. Dr John Barclay retired, subsequently dying in 1826 the year in which William , according to his class ticket, attended lectures in Anatomy, Physiology and Pathology by Robert Knox M.D. F.R.S.E. 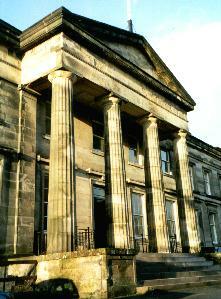 Member of the Royal College of Surgeons in Edinburgh successor to the late Dr John Barclay. Starting on the 1st of November that year he also took a course of lectures with John Thomson M.D. F.R.S.E. in 'Practice of Physic'. This ticket has written on the back 'I certify that Mr William Bowie has attended the Course of Lectures specified on the other side of this ticket signed John Thomson M.D. I hereby certify that Mr Bowie, Surgeon pursued his Anatomical and Surgical studies under my care, and very considerable proficiency in them. during the time I have been acquainted with Mr Bowie he was always attentive to his studies industrious and active and his conduct in every respect most gentlemanlike and correct; I feel no hesitation therefore in warmly recommending Mr Bowie, and declaring him likely to prove a most efficient medical man. This letter about William was written just eight months before Dr Knox took delivery of what was the first in a series of bodies for dissection in his classes that was to rock the country and lead to an enormous scandal for both the medical profession and Dr. Knox. Graduating in 1814 from the University of Edinburgh with the degree of M.D. Knox was appointed Assistant Surgeon in the army and was, almost immediately sent to treat the wounded of the Battle of Waterloo and later to the Cape of Good Hope where he extended his studies into the fields of anthropology. He left the army in 1820 and became a fellow of the Royal Society of Edinburgh and in 1825 a Fellow of the Royal College of Surgeons in Edinburgh. Knox took over Dr John Barclay's anatomy classes in 1825 and quickly gained a reputation as an anatomist that was tarnished only by his association with the infamous Burke and Hare, two Ulstermen who came to Scotland to work as laborours on the Union Canal. Knowing of the need for bodies for dissection at the medical school and hoping to make some fast money they, contrary to the stories of 'grave robbing', procured their bodies by murder developing a method of suffocating their victims that left no traces. The bodies were then delivered to Dr Knox who asked no questions. Knox is immortalised in the J.M. Barrie play 'The Anatomist'. Hare eventually turned Kings Evidence and was released to flee the country while Burke took the full brunt of the law and was hanged on the 28th January 1829. The execution was public as was the custom of the time and over 20.000 people watched The Stirling Advertiser of Friday the 29th January, giving a highly detailed account of the proceedings, expressed it thus "( The crowds) filled every window and house top from which a glimpse of the criminal could be obtained." The crowd not feeling that full justice was being done shouted " Hare, Hare, Bring Hare" and "Hang, Knox, he's a noxious morsel." The riots continued after Burke's execution as Professor Monro dissected Burke's body in what can only be considered as macabre 'poetic justice'. A full scale committee of enquiry was set up to examine Knox's part in the affair and it concluded that, while he was innocent of any complicity in the murders, he should have ascertained where the bodies came from. William Bowie would not have dissected any of the Burke and Hare bodies graduating in June 1827 as he did. The Stirling Advertiser for Friday 29th January 1829, quoting the Edinburgh Courant, publishes a full page confession of Burke. Talking about his victims we get a clue to when the murderous trade commenced. Burke says "Abigail Simpson was murdered on the 12th February 1828, on the forenoon of the day"-----after killing her " when it was convenient they took her to Dr. Knox's dissecting rooms in Surgeons Square, and got ten pounds for her." After graduating from Edinburgh William appears to have spent some time working locally in Stirling. In a letter dated Stirling, 15th August 1827 David Dobie, Surgeon, Stirlingshire Militia states " I hereby certify that Mr William Bowie, Surgeon, has attended the military Hospital under me, and also my private patients, and that he has conducted himself with the utmost propriety and with great zeal in his profession and also with benefits to the patients under my care." To understand the timing and purpose of this reference it is necessary to go back to July of 1827 when, it would appear that William, together with his brothers and sisters, went with Captain Napier Forrester and Mrs Forrester, (Margaret Bowie's sister Christian) to North Queensferry situated on the other side of the Forth from Edinburgh, staying with Eduard Thomson Esq. This we know from details in a letter so addressed to William from his Father in Stirling dated 8th July 1827 and marked 'Haste, deliver immediately ' and 'Paid Double letter. As you were anxious to hear of any situation that might occupy your time usefully for some years I write this to inform you that there is an oppening in the neighbourhood of Portpatrick where from all I can learn an intelligent practitioner might do well. My Father I believe has already informed you of the situation --- several gentlemen in the county have agreed to guarantee �35 for the first three years and �20 for the following two years to any properly introduced practitioner independent of the fees he shall secure from them when his attendance is required. The country is populous and their is no medical man within eight miles of the place--Should you think it worth while to try your fortune there it would be well for you to come to town immediately to perfect yourself in Midwifery--Pray write to me by return of post. I have this evening taken posession of my lodging and the very first thing I sit down to do is to give you an account of how I have been getting on since I left you so that your mind may be kept a little at ease. I have been living in Mr Gordon's Inn for the time I have been here and have------- a very great deal of kindnessshewn me from himself and also from his family. I settled the bill tonight before leaving his house and all he charged me was for my victuals he would not take a farthing for my bed. After hovering about for a day or two I found that there was no such thing as a comfortable furnished lodging to be got. I was then advised by Mr Gordon to take this lodging I have got which consists of two tolerable good rooms unfurnished and he, Mr G., had plenty of furniture being by him which he said would be at my service. I consequently called (Along with Mr Murdoch the Factor) upon the proprietor of the house to try and make a bargain. There was no room for----- on the occasion as the man said he would not take anything from the Doctor for the two rooms till the first term but that if I remain after that he would charge four pounds a year for it. The next thing was the difficulty of getting my victuals cooked. I was however soon provided for in this respect too as the woman on the same flat has a servant that is to attend to me and do everything I want. mr gordon has given me a four poster beadstead with no less than white curtains newly out of the mangle---a matress,good feather bed, blankets sheets and pillows basin stand table four chairs etc for my bedroom and chairs and table for my parlour. I hope the Lord is favouring my undertaking. So much for my success in that respect I must now say a little about the people beginning with the Minister the Rev I Gentleman has been a long time famed for marrying Irish run-away couples in fact I am told he kept an establishment not unlike Gretna Green for a number of years until the Presbytery put a stop to it. He has made a practice of charging ten guineas for marrying runaways and in that way has made himself well up. He is a man of above 80 years of age and is still a great player of cards particularly the game of whist. I think Mr--------( Local Stirling Minister) would think me in a heathen land were you telling him this. The church goes in here on Sunday at 12 and comes out at a little after one in the forenoon it goes in at half past two and comes out about four afternoon. I find I do not have room to say any more about any of the people at present. I may mention that I have got fourteen patients but a number of them very poor. I would be the better of two pairs of your cotton sheets if you could spare them as also two table clothes and four or five towels but it strikes me I will be better just to purchase two table cloths and a few towels in Stranraer than to have you send them. I would like two pairs of cotton sheets at any rate and you can consider what will be the best plan as to the others. Mr Gordon says that the best way you can send them is by the carier. if you give the parcel to Wordie( A local Stirling firm still with business interests to this day) he will give it to the carrier that comes this direction. will you send me the stand for my scales in the parcel if it is ready. Now I hope you will not be backward in writing me regularly. I will expect a letter from you soon again and be sure and mention whether or not you are all well and what news are worthy. I was much pleased to see the Journal . the letter and newspaper came safe to hand. if I had room I would say a great deal more but I will write my next soon. You will receive from the Stranraer Carrier and Mr. Wordie this day a box with 2 pairs of sheets 4 towels and 2 table cloths. I would have sent your bolster and pillow slips but they are either dirty or cannot be got. You must just purchase them. I am sending a few apples and one----?---- I am afraid that the apples are not ripe but I wished you to have a share tho small------?----- fruits. I am most happy to find you are getting on so well. We are all pretty well and Christina is quite recovered---nothing new only we are getting on with the Bank. You will require to be a good deal on your guard amongst the people for some time till you know them and keep your mind to yourself a good deal and by no means allow anyone to know too much of your business or mind in any way. I expect to hear from you soon and be sure to put the sheets to the fire before you use them. An interesting letter from father to son and a noticeable contrast to the one above. William, from his last letter, has the enthusiasm of youth and a sense of having done very well and being proud of his achievement in getting himself organised in Portpatrick whereas Alexander Bowie, with more maturity and possibly the experience of having been brought up in a small village, advises a degree of caution in dealing with the locals. Alexander Bowie's reply almost sounds like a rebuke to William for so openly discussing the people of Portpatrick. The two together tell much of the relationship between the two. The very formal signature and considerable discrepancy in the level of expressed affection and, even if we make allowances for the fact that the letter was penned in haste suggests a great deal of emotional reserve shown by Bowie's reply.